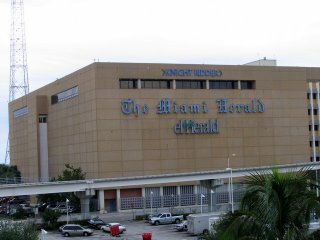 First established in 1903, the Miami Herald (name acquired in 1910) is South Florida's oldest newspaper. It has won 18 Pulitzer Prizes during it's run and is considered to be one of the best newspapers of the nation, especially on its coverage of Latin America. The paper publishes also a Spanish edition called El Nuevo Herald. The big blocky building sits on a prime spot of real estate right on the bay, and just down from the American Airlines Arena.